The other day, I saw someone (don’t ask me who) on Twitter make the claim that the current iteration of the once long-lived Planet of the Apes franchise was one of the most thoughtful set of blockbusters we currently have. I pondered that, trying to find something that might challenge this lofty claim. Given how lacking in resonance most big budget fare is these days (with more concern for aping the Marvel formula overtaking the need to develop theme and redolent characterization), I came up pretty empty. It’s funny: in the original series, the films that focused on Caesar (Conquest, Battle) were the least interesting chapters. But this reboot, beautifully introduced by Rupert Wyatt, and now taken over by young visionary Matt Reeves, has won over most critics, in a particularly uproarious fashion with 2014’s Dawn of the Planet of the Apes. For my part, I kind of break away from the pack a bit, finding Rise of the Planet of the Apes to be the more entertaining entry, with it’s stronger emotional core and a surprisingly compelling performance from James Franco. A solid double if there ever was one. Andy Serkis, the star of the show as the mo-capped Caesar, is always tremendous in each performance he gives, but there was something about Dawn that felt particularly…basic. While the craft was undeniable, I struggled to care about its tedious plot, and the most emotion it could conjure in me was how badly I felt for Serkis having to bounce off a particularly bland Jason Clarke. But, as always, a new film gives way to new possibilities, and let me tell you something: War for the Planet of the Apes has the goods. It’s not only the best film in the entire franchise, new or old, it’s also one of the best movies I’ve seen this year. I was floored by it. What is it that sets War apart? For starters, Reeves and Mark Bomback (along with co-writer Pierre Boulle) make the fateful decision to finally spare the audience any sort of major human protagonist with which Caesar is forced to share the screen. Sure, there’s a human or two involved (one a villain, the other a silent, plucky child), but finally the focus of the story is firmly planted with the best weapon this franchise has, its simian star. There’s a lot that can be said about Andy Serkis’ performance here, and it of course picks up right where his great work in the previous two films leave off. But now that the story completely circles around him, there’s a sense of elevation in how he brings this older, much more tired ape to life. I had difficulty being able to tell where the man ended and the CGI wizardry began. With this film, Serkis stopped being the actor doing a great job in the mo-cap suit and instead outright made Caesar the living, breathing character this series has consistently threatened to deliver. That he’s dropped into a story worthy of his performance, finally, is equally elating. Again, a bit of a misnomer of a title, as this really only takes place within the outskirts of a war, what’s offered here is a P.O.W. tale more than anything else. After a skirmish between a small battalion of soldiers and Caesar’s army, a display of mercy from the ape commander leads to disastrous consequence as the unbalanced Colonel McCullogh (Woody Harrelson), obsessed with eliminating Caesar, instead takes away something far more precious to him. This leads Caesar on a mission to take revenge on the Colonel, right in the heart of his camp. Luckily, he’s joined by his unerring companions Rocket (Terry Notary), Maurice (Karin Konoval), and Luca (Michael Adamthwaite). Along the way, they pick up a mute young girl who comes to be known as Nova (Amiah Miller), affected by the disease that spread at the end of Rise – a disease that is continuing to mutate within humanity, and another chimpanzee, named Bad Ape (Steve Zahn). This is a rather bleak film, as one might imagine of a story where humanity is in full decline its treatment of the apes nearly borders on the sadistic. But its where Reeves and company so expertly balance out wide-ranging conflict with emotional intimacy that allows this film to sing in a way that transcends its grim underpinnings. The tragedy of Caesar displayed here is that of a ruler completely come undone in a quest for vengeance, and when the true cost of war is made apparent to him, its one of the more horrifying sequences projected onto the big screen this year. What begins as a rousing revenge picture eventually gives way to an unexpected prison drama, that while (perhaps clumsily) echoing a few elements of today’s political environment, firmly plants itself as a parable for acceptance and the destructive nature of intolerance. The fact that it also had a conclusion that left me pretty breathless speaks volumes. It’s a strikingly beautiful film as well. There’s very little I can recall of Reeves’ behind the camera efforts in Dawn, likely being a bit handcuffed by the studio and the material itself. But here, he’s able to cut loose with a number of long-takes that rival some of the best combat and neo-western pictures, which are tied off with perhaps the best scoring work of Michael Giacchino’s career. It’s rare to find a blockbuster that is so driven by its musical cues, as often the score is one of the most tossed-off efforts in today’s tentpole development (see Giacchino’s own compositions in last year’s Doctor Strange), but here the combination of his haunting motifs with Michael Seresin’s cinematography is visually arresting in a way that I haven’t found myself struck in some time – at least where action pictures are concerned. And of course, I’d be remiss if I didn’t mention how great Zahn is in this. Despite what sounds like a exercise in misery, Bad Ape is an absolute delight throughout. The only other ape that speaks full dialogue throughout the film beyond Caesar himself, Bad Ape is where most of the comic relief is found, and despite coming ever so close to seeming like he might be a derailing factor tonally, he instead is a needed respite that I honestly couldn’t imagine the movie without. He also represents a new type of character within these films, an ape that’s basically uninterested in being a part of Caesar’s fight and is instead focused on survival. That sort of peek into what the “rest of apekind” might look like enrichens an already thematically impressive effort. 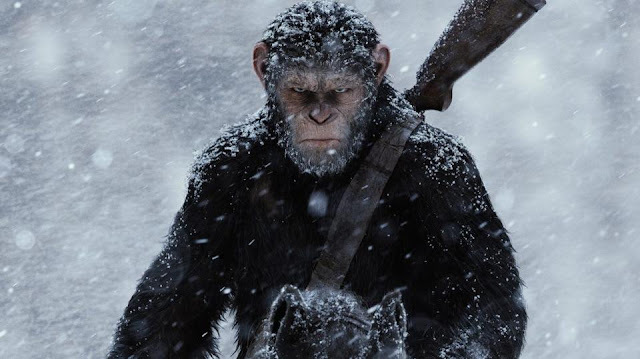 War for the Planet of the Apes is exhilarating and melds together an expert level of craft and performance that shores itself up as one of the delights of this Summer season, an incredible feat for a movie that spends quite a bit of time without the use of speech among its stars. It’s so good, it stands shoulder to shoulder with the 1968 original, perhaps even toppling it. I’ll let you decide.